All of us can use a little help in waking up in the morning---and there are hundreds of models of alarm clocks on the market that can help us do so. Some use loud sounds, the more inventive shoot whirligigs off a base unit—and the alarm won’t shut off until the clever missile is returned to its cradle—and you can’t just go back to bed, because in fifteen minutes it will do it all over again). However, the vast majority of alarm clocks make a major assumption---that the sleeper can hear and will rouse to loud noise. For the hard of hearing and the profoundly deaf—a noise generating alarm clock has limited usefulness—and those with a hearing disability have every bit the same need to be roused from sleep in time to make it to work or school as the hearing folk do. One of the best ways to rouse a sleeper is by shaking them awake. Based on this theory, there are several models of vibrating alarm clocks on the market from low cost models to higher end units. 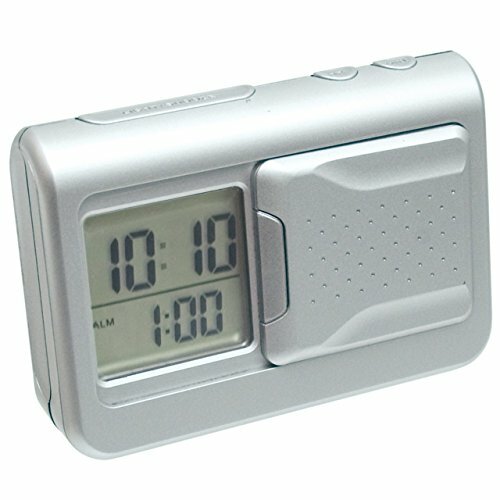 One of these is the VibraWake Sigma Hearing Impaired Vibrating Alarm Clock. This two piece unit consists of a wireless vibrating alarm that slips neatly inside a pillowcase while the base unit remains on the bedside table. The wireless alarm is small enough not to add to the discomfort of the sleeper, but powerful enough to shake even the deepest sleeper awake. Awakening to sunrise is considered to be one of the most natural and healthful ways to rouse from slumber, but depending on the time of year, the sun doesn’t always rise at the same time we need to. Answering this problem the folks at Soleil Ultima have introduced the SOLEIL SUN Alarm Ultima Clock Radio Dawn Simulator. The patented “Sunrise” feature activates a built in light which gradually increases from zero to full intensity over a pre-selected time interval (15, 30, 60, 80 or 120 minutes). The unit also boasts a “Sunset” feature which gradually decreases the brightness of the built in light to simulate a sunset. The display is easy to read and can be dimmed or used at full brightness. For heavy sleepers there is an optional flasher and beeper which can up the annoyance factor although the beeper function is of limited value to the deaf user. The unit also features a clock radio, a snooze alarm, and comes with a built in 9v batter backup system in the event of power outages. It also has a security feature –the lamp can be turned off and on at random intervals to deter intruders when the user is away from home. 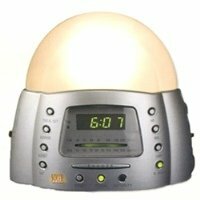 To get the best results with this unit---the clock should be placed on a bedside table or nightstand at eye level. 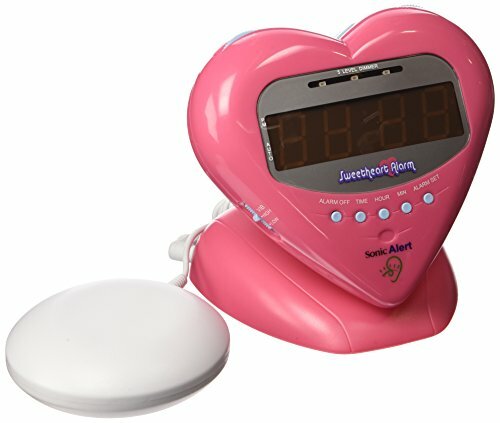 Another model which marries sound and vibration in one unit is the Sonic Boom SBH400ss Sweetheart Loud Plus Vibrating Alarm Clock—shaped like a pink heart, this is a child friendly unit that is packed with both a 12 volt bed shaker and pulsating flashing alert lights. Included features include a Hi/low display dimmer switch to reduce light pollution at night; an extra loud audio alarm, and 9v battery backup. The shaker function has several options, including vibrate only, vibrate and alarm buzzer or buzzer only—the tone and volume of the buzzer are widely adjustable—up to 113 db. The vibration is delivered in short bursts to amp up the annoyance factor. Another option based on vibration technology is the Silent Vibrating Personal Alarm Clock "Shake-N-Wake". This model takes the alarm clock off the night stand and straps it to a wrist or ankle—making it an ideal choice not just for home use but for travel as well. The “Shake-N-Wake” is lightweight, soft and comfortable to wear, and it has a one touch backlight for middle of the night time checks. This model doubles as a medication timer as well. And it operates on one AAA battery which is not included. The Vibrating Pillow LCD Alarm Clock by Maxi-Aids is designed to be slipped under your pillow, but functions just as well as a compact nightstand alarm using the alternate beeper function. The clock features a LCD display with a green backlight, a vibrating alarm system, 12 or 24 hour time formats. This useful clock also displays the temperature in Fahrenheit or Celsius and comes with a soft “pleather” carry/storage case---its size, light weight and battery operation make it an ideal travel alarm as well as a dependable home unit. Additional features include a key lock to prevent accidental button pushes, and a built in pivot stand for nightstand use. 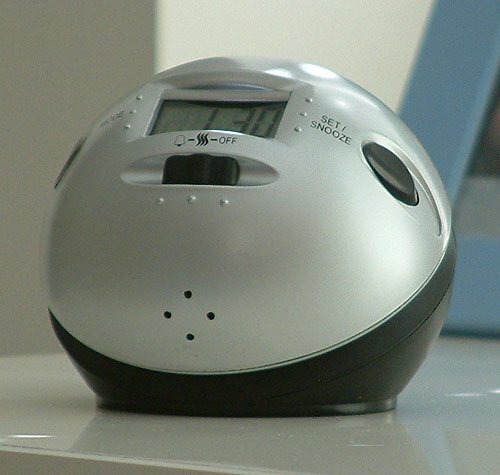 The Amplicom 93411 Analog Alarm Clock with Wireless Vibrating Pad features an Easy to read illuminated analog clock face, a wireless “bed shaker pad”, as well as a snooze button with a delay option. The alternative 90 dB sound alarm boasts five different sound patterns for those with partial hearing. 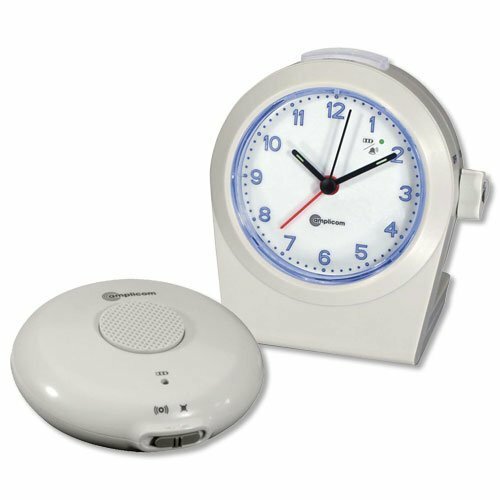 These are just a few of the available options in alarm clocks for the hearing impaired—there are many more available in a wide variety of prices and offering various optional features—this is one time where comparison shopping can yield great results and the best product fit. Online shopping sites and search engine shopping tools exist for price and feature comparison ---which can save you a lot of time and a great deal of frustration!